The CF-30 Plastic Coil Forming System is a new concept in forming equipment designed for manufacturing plastic coil on demand. This machine produces exactly what you need, when you need it, featuring 7 filament profiles that yield 26 different coil diameters, from 6 through 50 mm. This Plastic Coil Forming System will save you money on freight because it eliminates the need to air freight coil in which increases your profit margin. The State of the Art PLC Control System features pre-programmed Roller Speed Ratios optimized for each, all the user has to do is simply key in the diameter of coil being run and the mandrels speed and the roller speeds adjust accordingly. The innovative hot start features allows the new concept former to stop and start without any interruptions in production. The hot air keeps the filament warm as it exists the heater drum so that when the former re starts there is no product distortion! If you have any questions or are interested in purchasing the CF-30 Plastic Coil Forming System, visit us at SpiralBinding.com. 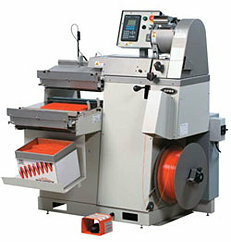 We have great pricing on a full line of Automatic Inserting and Coil Forming Machines. Call us at 1-800-631-3572 for more information!